Behind the scene at Monocircus' atelier, we have been busy summing up our accounts for the past year. Out of all the items we have in store, we managed to rank the TOP 10 Most Popular Items of Year 2012! we had a rather tough time trying to accumulate enough items to start up the store. Now after a year, we are very pleased that we managed to have such a variety and volume of wonderful items in our store. we find it amazing ourselves to be able to come this far. for their patronage, encouragement and friendship. Before I ramble on further, let's get back to presenting our TOP 10 Items of 2012! FLORAL CLASP BAG came in no.1! Unfortunately we are afraid to announce that this item will be out of stock permanently due to various unforeseen circumstances. CIRCUS RING is our no.2 most popular item! this item is our most precious creation! One of our personal favorite! so in the mean time, perhaps you can tell us the ring size you would prefer! Just email us! no.3 is our recent item, MOJABLACK! Fluffy and warm fleece neck warmer, this handmade item is just great for this winter season! no.4 is our original TRAVEL TAG series! Funky and fun name tags to put on your luggages when you travel! The kids size version of our moja series, MOJAGRAY came in no.5! Cute and warm and FUN for the little ones! It was a popular item for Christmas gifts! BROOBPA by Kaeken is no.6! Funky brooch made in thinly cut black and white striped fabric strips. An item that jazz up any cardigan or tops! Our CROCHET HATS came in no.7! Made in organic cotton yarn, with detachable velcroed emblems that are simply wonderful! We are almost running out of stock for these but they will be coming in soon so wait up! Then there is our no.8 item, METABALL! This was one of our very first work created out of our little 3D printing robot in our atelier! 3D printed by advanced technologies in a facility in Holland. This is also one of our personal fave! no.10 is our Doinky Doodles PASSPORTHOLDERS! Handmade by a fellow Singaporean artist. Wonderful items created out of vintage clothing! 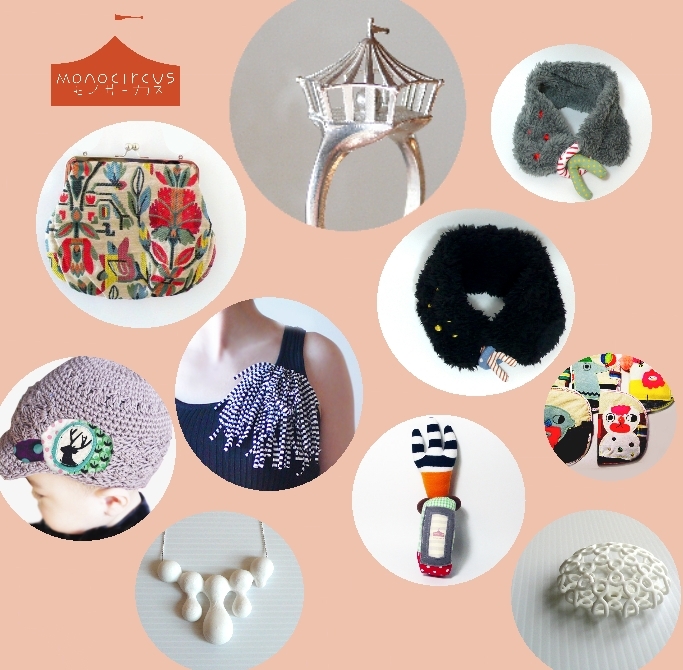 and of course, we have a whole lot of other wonderful items at Monocircus that deserves more than a look at! so come by every now and then cos we have new items up almost every month! Feel free to drop us your comments and reviews! Art Work created for LEXUS NEW TAKUMI PROJECT now available for purchase.